When Ubisoft announced Trials Rising at E3 2018, I was particularly excited to learn that it would be coming out on Nintendo Switch. Like so many other games, it immediately struck me as a great fit for Nintendo's hybrid portable. How could it not be? Ubisoft's famously silly dirt bike racer seemingly ticks all the boxes for Switch: easy to pick up and play on short notice, lightweight graphics, and an addictive gameplay loop. When evaluating a game's fit for Switch, the first question I often ask myself is, "Would I want to break this out on a long flight?" On paper, the answer for Trials Rising is an emphatic "yes." Having now spent some time with the Switch version, though, I'm a little less certain about its prospects than before. I think Ubisoft has done a really good job of faithfully translating it with as few compromises as possible, and its rapidfire racing still has a chance to be addictive in a portable setting. But nevertheless, it's not as clean a fit as I initially supposed. Trials Rising, like the rest of the games in the series, is deceptively simple to start. The early levels are mostly a matter of managing momentum, with only a handful of difficult obstacles to negotiate. It's here that you learn crucial concepts like proper acceleration, making long jumps, and landing on both wheels. Once you master these elements, Trials Rising takes off the gloves and becomes, well, really hard. Its levels, which are themed after real-world locations like Egypt and Hollwood, require you to manipulate both acceleration and wheel placement in such a way that you can reach otherwise impossible areas. In the level set on Mt. Everest, the start-stop nature of the climbing almost makes it feels like a puzzle game, as you have to work out the exact method by which to scale a sheer cliff or treacherous rock formation. It's... kind of intense for a handheld game. Squinting at the Switch's portable screen, I found myself actually developing a headache as I reset over and over and over again. Trials Rising is a game that demands mastery, requiring that you make precise inputs as you carefully negotiate its increasingly gnarly terrain. Playing on a smaller handheld screen with the Switch's wider controller placement only increases the degree of difficulty in an already intense game. This is something I've noticed with handheld games in general, actually. Action games can work on Switch, 3DS, or iOS, but by and large I find myself gravitating toward slower-paced RPGs or simulations on those platforms because they are less technically demanding. They don't make you feel like you're fighting against the screen or the controls the way that Trials Rising does. The Switch's digital triggers in particular are ill-suited for a game like Trials Rising, where the most subtle change in acceleration can be the difference between a successful jump and a painful wipeout. Where the Xbox One's analog triggers afford a tremendous amount of control over how much you depress the gas, the Switch's triggers pretty much click straight down, which is troublesome on high-level tracks. It all adds up to a version that feels up to a version that feels just short of optimal. Casual players will quickly become frustrated with its high difficulty, while experienced players will find themselves wrestling with the controls. And that's on top of other issues that slowly become apparent as time goes on. The funny thing about Trials Rising is that it seems perfectly suited for Switch. Rapidfire games that can be played in short bursts work well on the platform, as recently exemplified by Diablo 3. Trials Rising is just the sort of game you'd expect would work well on a long flight, or for a quick round while lounging around on the couch. Still, the little things add up. Like Diablo 3, the Switch version of Trials Rising is noticeably fuzzier than its PS4 counterpart, even when played in docked mode. It nails the framerate on the tracks, but the menus are a tad rougher, with images and text that are clearly optimized for televisions. Like many other triple-A ports, it feels crammed on to the Switch—a surprising feeling to have with Trial Rising, which is for the most part a graphical lightweight. The main thing the Switch version has going for it is local multiplayer. Get enough friends into a room, and you can knock out a bunch of races together on handheld. It's got a sneaky Mario Kart 8 vibe to it, especially with the customizable dirt bikes. Of course, you still have to contend with the digital triggers, which is apt to result in lots of people failing to finish the tougher tracks. What's ironic is that Trials Rising reminds me of a certain other dirt bike racer: Excitebike. Excitebike also demands a degree of mastery, challenging racers to manage their engine temperature, momentum and other factors while avoiding obstacles. 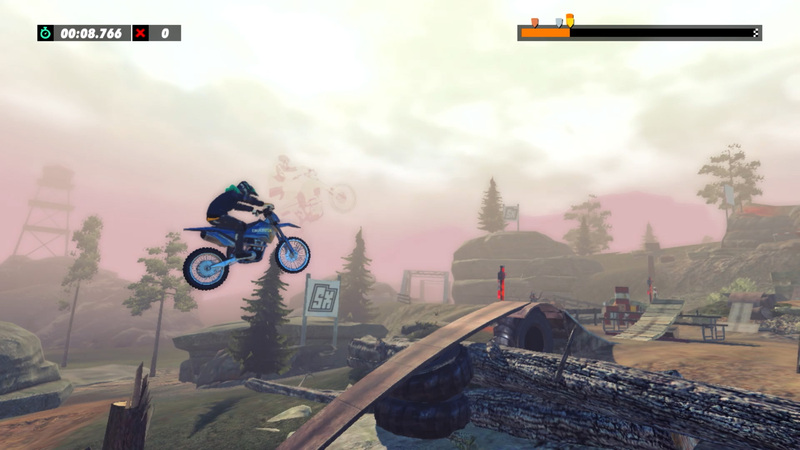 It's been close to a decade since Nintendo released an Excitebike game, making Trials Rising a natural heir to the throne. But as it stands, I would rather play it on PS4 or Xbox One. None of this is to say that Trials Rising is a complete non-starter on Switch. If you don't have a PS4 or Xbox One, but you love Trials, then the Switch looks like a decent alternative. Issues with digital triggers aside, Ubisoft does what it needs to do to make it work. It's just not the slam dunk that I was expecting for the platform. Trials Rising will be out February 26 on PS4, Switch, Xbox One, and PC. You can find the rest of our Trials Rising coverage here. Tagged with Opinions,	Racing,	Switch,	Ubisoft.